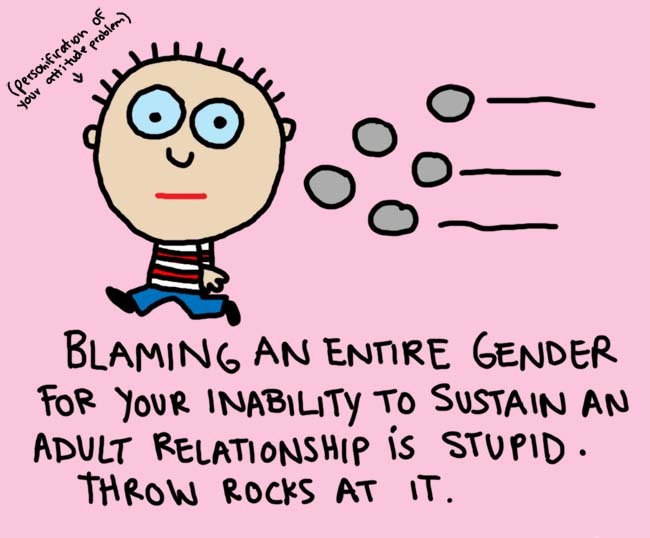 The above image is actually a parody by Natalie Dee of the well known “Boys are Stupid” image by Todd Goldman. Todd has gone on to spawn an empire of clothing based on similar designs. It seems his empire of sardonic humor is beginning to crumble. It seems that Todd Goldman copied an image almost verbatim from another artist named Shmorky and began selling it in his catalog. Being familiar with Shmorky’s work I was interested in the story when I first read it a week ago. However, this thing has snowballed into something huge. The website chronicling Todd’s plagiarism is filling up with more examples of stolen work every day. I decided to post something about this when I discovered that he also had stolen work from Bill Waterson, creator of the most brilliant daily comic ever, Calvin & Hobbes. How someone can go on for so long without being called out for blatent intellectual theft is pretty amazing. What is even more astounding is how quickly one internet meme can destroy an entire reputation. Andy Warhol once stated that in the future everyone would have their fifteen minutes of fame. With the advent of the internet though, that fifteen minutes of fame can be cut off short. It is also interesting to note that this story would most likely never be covered by major news media outlets. Bloggers are more adept at fact checking these types of stories. They are not burdened by the advertisers and management of big media. They serve a function that would be absolutely impracticable. Todd Goldman just got a smack down on a grand scale from a source I highly doubt he ever suspected. Had big media covered this event, he could have his PR department issue a statement and that would be that. Issuing that same style of PR statement on the internet would be the same as throwing yourself to the wolves. You will get torn apart. I am willing to bet that because his target demographic is mostly internet-savy his sales for the upcoming quarters will be down. Full Disclosure: One time in the Oshkosh Advance-Titan newspaper I was accused in the Gripe Line of stealing work from explodingdog.com. Typically when you draw stick people though they are going to look similar. Truth be told I am a much bigger fan of the afformentioned Natalie Dee. I have also never profited from any drawings I have done, nor do I plan on ever doing so. Imitation is the sincerest form of flattery, unless there is money involved. Then its just theft. You may have noticed that I am now using a slightly different theme for my site. Of all of the WordPress themes I tried today the default ones seem to suit my needs the best. I was using the original Kubrick theme, but personally modifed the code suit my needs. K2 is very similar, but will also need some modification. I do not care for the following elements. The floating orange RSS icon above the comments section in the sidebar. The “Main” tab in the title bar. I did away with individual sections long ago. All information can be searched for by using the categories. The “Site Admin” tab in the title bar. Yuck. The useless small clock icon under the title of a post that does not even tell what time the content was posted. You will notice at the footer it just says “is powered by WordPress and K2.” WordPress uses the same variable for both the title and footer. I don’t have a variable defined because my title is drawn into the header image. I’ll have to manually input the footer. Visited link color is currently red. Yuck. I have been given access to post writings on Ken’s website. Anyone fortunate enough to know Ken realizes the level of commitment displayed by this gesture. This reaches far beyond an engagement ring or raising a puppy together. I didn’t expect this to happen until his website was in it’s dying days and his fan base dropped to zero. But, for whatever reason, Ken found me worthy enough to have some control over posting and formatting. I could use this power for good or evil. Expand his fan base or destroy the following he has worked so hard to develop over the years. Alas, I have grown quite fond of him over the past two years and I cannot find it in my heart to destroy him. So out of respect for him and respect for his loyal readers, this is the first of only a few web posting I will write. I will save my sarcasm and witty remarks for his comment sections. However, I will continue to bask in the eternal glory and power that has been bestowed upon me. It is coming to be that time of year again for the UW-Oshkosh Department of Residence Life! It is the time of year where despite the ever increasing end of semester workload Res-Life decides to get together to throw the biggest event of the year. That’s right! The End of Year Banquet! Let me get right down to brass tax. Kaela Lindquist should win Programming Assistant of the year and here is why. She does a much better job running the Stewart Hall desk than I ever did. Let us not forget the disastrous Summer Stewart Regime of 2005. She not only manages the Stewart Hall desk, but also the Evans Hall desk. Have you ever met some of the people who live in Stewart? Anyone who can train desk workers to field massive idiocy on an epidemic scale deserves the award. Have you ever met some of the people who live in Evans? Anyone who can train desk workers to field freshman and sophmore idiocy on an epidemic scale deserves the award. She has Jedi-like precognition skills in anticipating problems even before desk workers complain or ask. She gives me the left over nacho cheese that can’t be sold, but isn’t quite expired yet. She was trained by the best. AB yeah yeah! She punctually files paperwork like its her job. Not only does she balance her work load, classes, and personal life with style and grace, but she also may be canonized as a saint for dating a totally meat-headed buffoon. Having former coworkers who have won significant awards (e.g. Summer Hudson, Dana Blado, Jamie Mendralla, Nick Cisler, etcetera…) and living exemplar of Res-Life mediocrity, I am more than qualified to point out from the sidelines what a real canditate for such an honor is. Thank you. The Latin motto carpe diem is used ad nauseum by potential motivators who lack sufficient creative qualities or interesting content to duly arrive at their imperative call to action. It is a small step up from bosses who use sports analogies out of both convenience and lack of adequate metaphor resources. By the time the speaker has pitched you their seize the day line, you have already struck out at the attention bat. Dealing with loneliness is something that they do not prepare you for when you decide to spend a semester abroad. The typical advice consists of “be sure to buy an international calling card, don’t be afraid to try new things, and write home every now-and-then.” I can call home or you can call me with local Oshkosh rates with my Skype number (920-626-4536). Apple’s iChat provides me with the opportunity to speak face-to-face with friends via video conferencing. I have tried plenty local food items. I write postcards every week to a lucky few. Check… check… and check. So what is the problem? Have you not met people there and made new friends? The Facebook profile would seem to indicate that I interact on some amicable level with other people. The feelings of being alone usually do not occur when engaged in these sorts of activities. Their brief durations occupy time and release endorphins, which your brain would interpret as pleasurable. In the middle of this last night I woke up flailing my left arm, looking for that familiar collection of attractive curves I call my girlfriend. In my semi-conscious state I found nothing but empty space, which thrust me into an unanticipated panic. Then came the gripping realization that she was 4500 miles away. I layed back down and tried to tell myself “everything is okay.” It is moments like those that are the most difficult. The conditioned responses stemming from two years of sleeping at someone’s side that you are powerless to stop. The conditioned responses stemming from the familiar environment around oneself that make day-to-day life easy. That experience put me into a magnificent slump. I have done nothing all day today but sit in front of my dying laptop in some vain effort to scorn the world outside my door by not gracing it with my presence. I drank almost two liters of Pepsi Light while sitting here all day and now I cannot sleep. I have not seized any portion of this day. The folks over at RetroMacCast were kind enough to include a photo I sent in to them in their podcast. Be sure to check out Episode 18 where they read my letter as their first item of discussion. You can download RetroMacCast with iTunes (preferred) or directly from their website. Kennst du das Fernsehprogramm X-Files? Agent Scully ist jetzt mir mehr geil. Die Brüder Grimm studierten Buchstabe. Dieses Band… vielleicht nicht. Vielen Dank John. Er sitzt allein neben der Deutsche-Bahn. Seine Arbeit ist ein bißchen langweilig. Der Film 300, den ich letzte Woche gesehen habe, ist besser auf Deutsch! Das ist Sparta! Ein Lieblingsfilm von mir heißt “Street Fighter II.” Es war das erste Mal, das ich das Lied “Ultra” von die deutsche Rockgruppe KMFDM gehört hatte. Dieses lustiges Lied handelt von Abkürzungen. Das Musikvideo für “Believe” aus dem Film Lola Rennt. Why do great and revolutionary ideas occur in strokes? Is it not potentially life threatening then, to be a genius? Would said stroke and its effects impair the genius’ capability to relate the idea to others? Is is possible to have a “gran mal seizure” of genius? Are the maladies that follow such monumental moments of genius limited to the brain? e.g. A heart attack of clarity. An infarction of prodigy. Renal failure of brilliance. Diabetes of erudition. Would I have to then alert my insurance company of my intelligence quotient, thereby making it more difficult to obtain adequate heath insurance coverage? (Darwin Warning: Christians jump ahead to question 9.) Is it possible that nature has a built in Darwinian mechanism to severely limit the reproductive capabilities of geniuses by striking them with such maladies? If yes to question 7.: Does the function of such maladies serve a purpose, that being mantaining the intellectual hegemony of the species? (This question is for the bible thumpers who dispute Darwin out of hand.) Why does God love to smite the smarties? A little over a month ago, when I first arrived in Marburg, I was handed a sheet during the orientation session for the university. I was completely exhausted from three days of exploring Frankfurt on foot, the early train ride, and the extended wait to retrieve my luggage because the organizers forgot to drive me to where I needed to go. I was handed a sheet that was for an upcoming excursion that included food and an overnight stay in a hostel for the paltry sum of 25 Euro. Being highly suggestible at that particular moment, I signed up and handed over the money with little critical thinking. The day had been full of shelling out Euros, so really, is 25 Euro more really going to break the camel’s back? I have been stressed out this upcoming week because classes start tomorrow morning. Rather than spend time preparing mentally for this endeavor I had to venture out on this weekend trip to Rotenburg an der Fulda. My summation for the entire excursion is less than stellar. We basically spent 1-1/2 hours driving to a hostel with a park located behind it on Saturday. The businesses in the area were all closed, minus the requisite gas and grocery. Because we arrived in the afternoon we had to cut our exploration off short, while the organizers made us play games or act out skits. There was the mandatory drinking, dancing, card playing and chicanery. Sunday consisted of a short break followed by a guided tour. I am using the terminology “guided tour” both liberally and graciously, because we merely walked in a circle seeing buildings that we had already seen the day before. All the quaint little shops were, once again, not open for business. Rotenburg is a beautiful spot on the map of the Bundesrepublik, but I never want to return to it. The only matter of note is the history of Rotenburg. Convicted cannibal Armin Miewes committed his crime of passion here. I suggest you give the Wikipedia entry a gander as it is quite an intriguing yarn. Yesterday I was sitting on the grassy knoll in front of my residence reading Calvin & Hobbes “Rache des kleinen Mannes” in the sun. There was a group of children playing in the area, but I paid them no mind. A few minutes later one of them came up to me, asking how to get home. When I asked him where he lived, he said “New Jersey.” I asked him all the requisite questions such as “Where are you staying? Do you know a phone number? Who are you staying with?” But, unfortunately, he did not know anything to help me locate where he came from. I then decided to call the police. How this boy ended up thousands of miles away from home without knowing significant details about where he was, I will never know. The poor kid didn’t speak a bit of German. I just hope Evan Thomas found his parents. The police were certainly in no hurry, as it took them 25 minutes to show up and retrieve the lost boy.